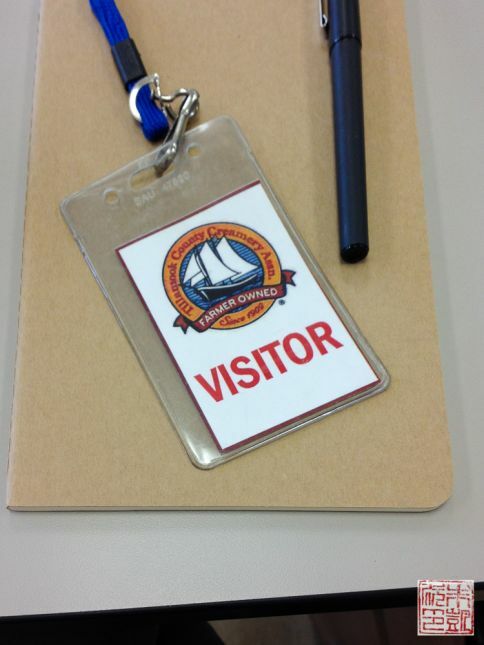 Disclosure: I was invited on this trip as a guest of Tillamook. All opinions in this post are my own. Happy Monday! Here’s a post I’ve been eager to get up – a recap of my trip up to Portland, Oregon to visit the Tillamook factory! 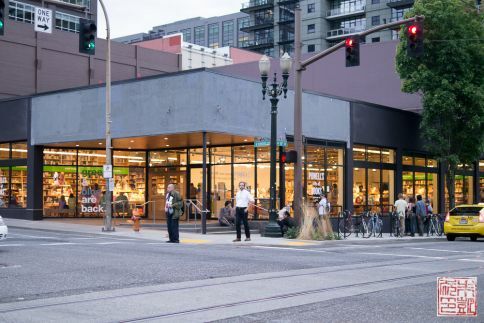 I’ve been peripherally aware of this Oregon-based brand, but it wasn’t until Tillamook did a pop-up shop in San Francisco a few months ago that I got to speak to some of their brand reps and learn more about their products. 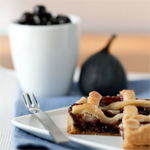 Although Tillamook is best known for their cheese, they’ve been rapidly expanding their product line, branching into yogurt and ice cream and even ice cream bars. After going home from the pop-up with a bag full of Tillabars, I was more than happy to get a chance to learn more about Tillamook in-depth. 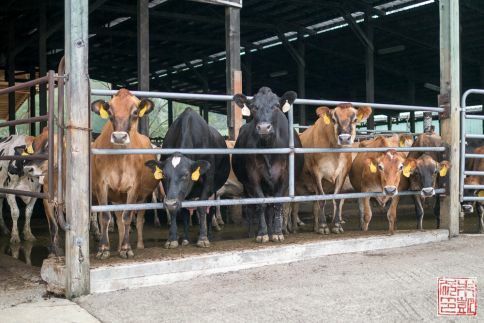 The Tillamook County Creamery Association in Tillamook, Oregon, is a dairy cooperative made up of over a hundred dairy farms. 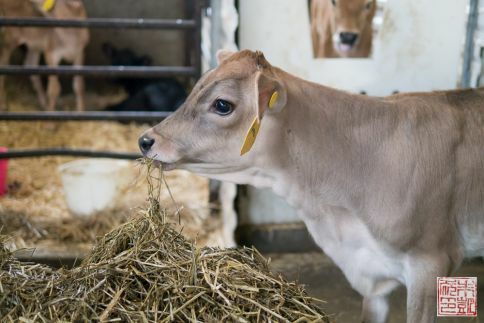 Together they produce and sell a wide range of dairy products, including their famous award-winning cheddar. 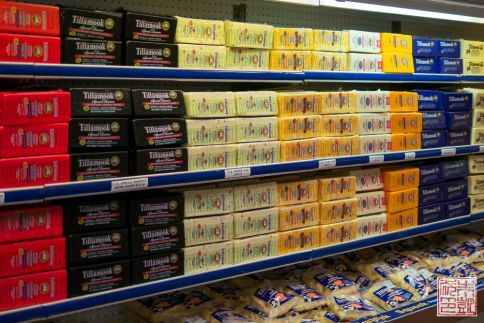 Tillamook products are mostly found in the Western US so far; I remember seeing their cheeses in my grocery store and, more recently, their butter, sour cream, yogurt, and ice creams. 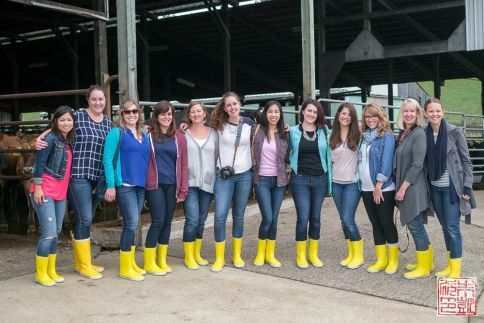 I was super thrilled when I was invited with a group of other bloggers to visit Portland and Tillamook and see the cows that produce the milk that ends up as Tillamook products, as well as visit the factory where some of their production and much of their R&D take place. 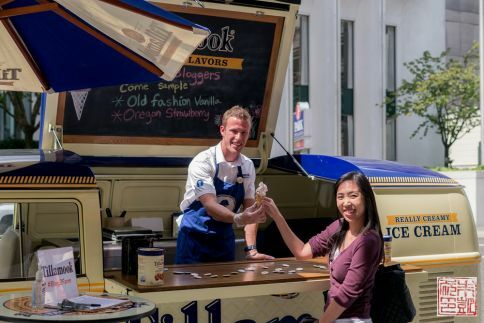 A sweet welcome to Portland: upon arriving in downtown and the Hotel Lucia, we discovered Tillamook had parked an ice cream stand right outside, serving up scoops of their ice cream. No way I’d say no to ice cream, especially after a morning of traveling! 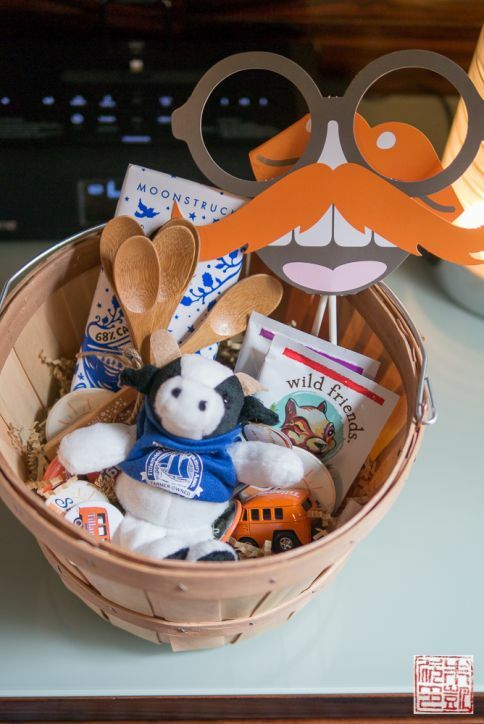 Another happy surprise: the welcome basket that was waiting in our hotel rooms, including more munchies. I saved the chocolate bar for later as I was already on a major sugar rush. The little toys and gizmos all went to Isabelle when I got home! The welcome reception and dinner was held at the Imperial Restaurant in the Hotel Lucia. 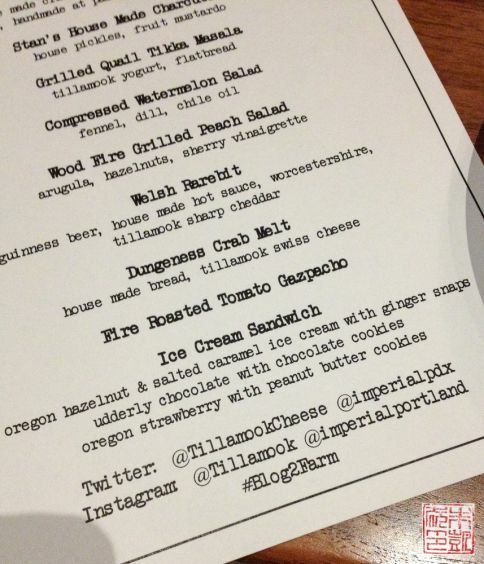 Tillamook cheese was featured prominently, and their ice cream made another appearance in the ice cream sandwiches. Yes, I had a LOT of ice cream that day! After dinner, a few of us bloggers decided to get in some more sightseeing, and ended up at the famous Powell’s bookstore. I mean, wouldn’t it be some sort of crime to come to Portland and not make a visit? 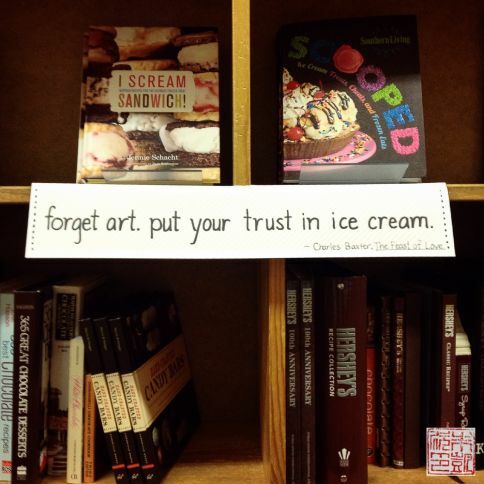 Especially if you’re a food blogger with a penchant for acquiring cookbooks. 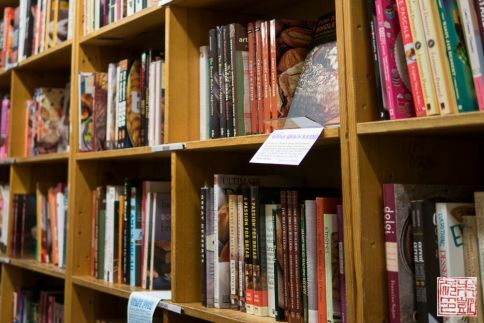 We could have spent all night at Powell’s, but as our time was limited we made for the cooking section. The baking area was appropriately, delightfully overwhelming. I don’t think I ever mourned the lack of browsing time so much. A serendipitously fantastic adage after my day of ice cream indulgence. The next morning we left Portland and got on our motor coach for the hour+ plus ride out to Tillamook, on the Oregon coast. 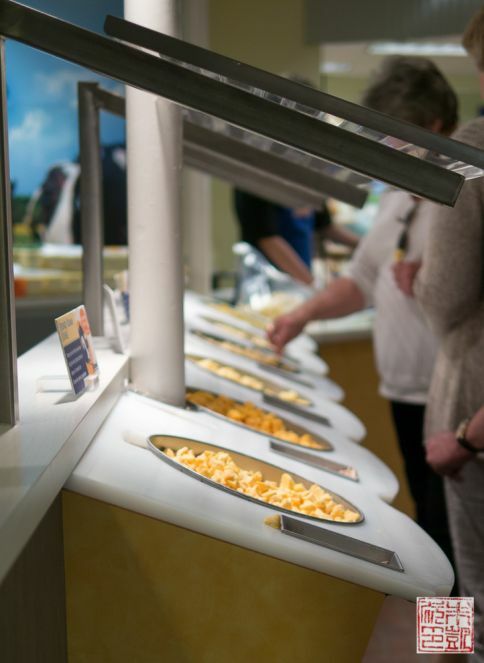 The Tillamook factory and visitor center is one of the biggest attractions on the coast, receiving over a million visitors a year. People come to get a glimpse of the cheese making process, have lunch and ice cream at the cafe, and buy lots of Tillamook cheese. Many of the employees we met at the factory were locals who all reminisced about visiting the factory when they were kids. It’s quite clearly a beloved local institution. We got a tour of the factory from Dale Baumgartner, the head cheese maker at Tillamook. 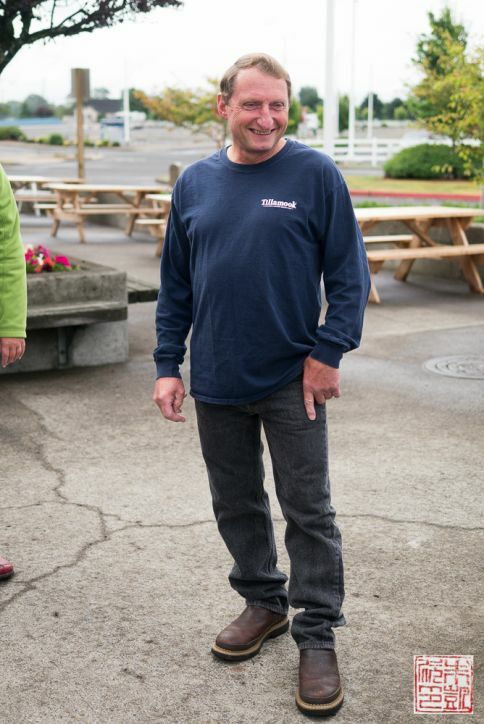 Dale started out working for a small creamery when he was in high school, and then ended up at Tillamook where he has been overseeing the cheese-making efforts for 45 years. He has pretty much dedicated his entire life to cheese. I asked him how different things were back when he first started and he replied that there were no machines and everything was done by hand- something he still loves doing in his free time today. 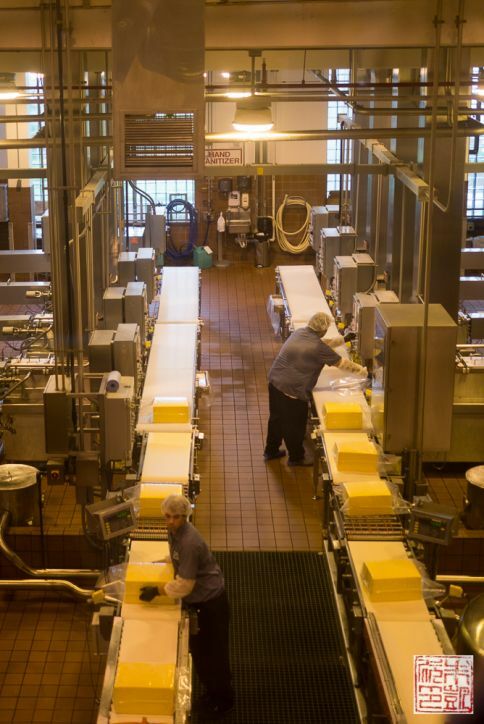 A view down into the factory where the workers are cutting and packaging blocks of cheese. 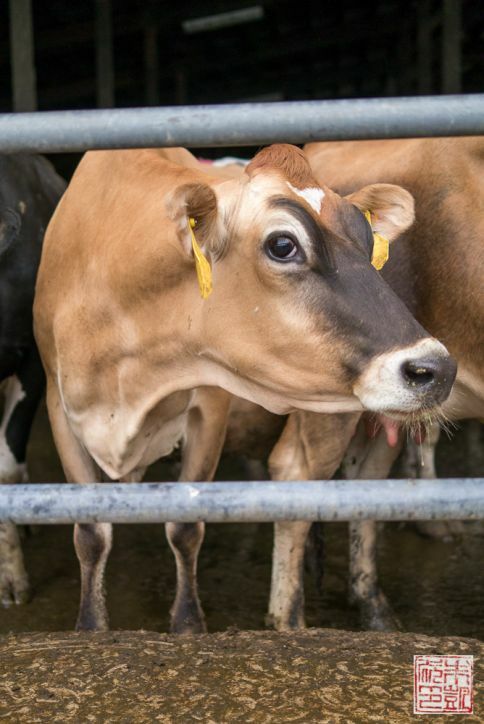 It takes about six and a half hours for milk to become cheese at Tillamook – about twice as long as some of their competitors. Some factoids posted above the factory windows. There’s a lot of cheese being made here! Another thing that Tillamook is quite proud of is how long they age their cheese. The longer a cheese is allowed to age before being packaged and sold, the stronger and more complex the flavor becomes. Obviously when you’re making large amounts of cheese commercially, the faster you get it to market the sooner you can sell it. 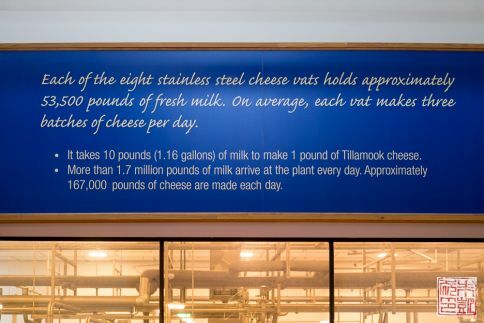 So it speaks to Tillamook’s commitment to quality that they age their cheese for at least 60 days, and often several months longer than that because they think the results are worth the extra time and higher price. 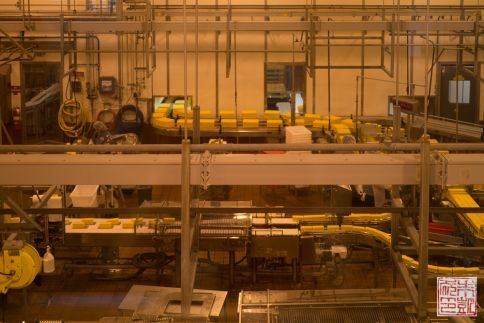 Another shot of the factory floor where the cheese is being cut and wrapped into consumer-sized packages. Before the cheese is checked and approved as ready to sell, it’s stored in a giant warehouse next to the factory. There are almost 15,000 pounds of cheese stored at 42 degrees F – we got to peek in and it was an awe-inspiring sight! After the factory tour, we discovered there was free cheese tasting – yes! Here we could compare the different cheeses and really see the difference that a few months of aging can make in the taste of a cheese. There is also a retail area at the factory that sells pretty much all the Tillamook products, including ones that don’t show up often in stores outside Oregon. It was pretty heady to be faced with a solid wall of cheese! 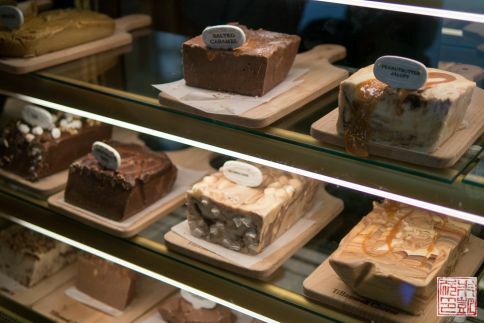 They also make and sell fudge at the factory store only; this fudge isn’t sold anywhere else. Maybe in the future! 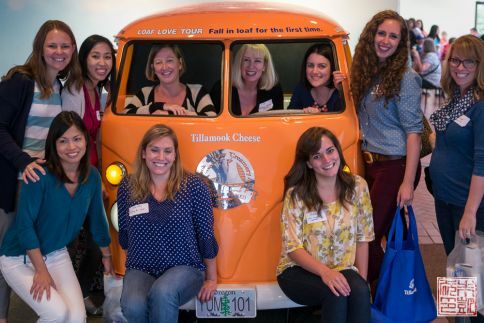 Here are most of us posing in front of the Tillamook bus in the front of the factory! For the second half of the tour, we were taken back to R&D and got to meet Jill Allen, the manager of product quality. Jill seems to have a great job: she gets test all of Tillamook’s products for quality, which of course includes a lot of taste testing. However, it’s a serious job and requires a well trained palate and good understanding of food science, both of which Jill demonstrated to us. 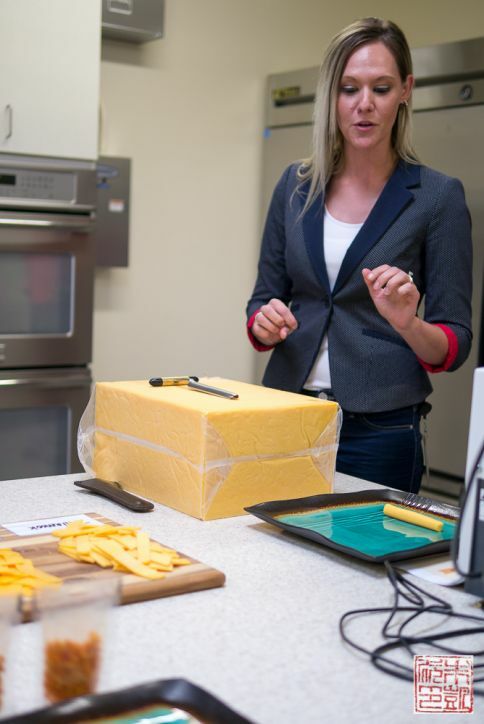 She led us through a tasting of several cheeses and explained the differences in flavor, She also works with product development, helping identify and refine desired flavor profiles. If you think her job is all fun, imagine the day she had to taste several different varieties of chili peppers, first thing in the morning! Still, we learned a lot about how to taste and compare different cheeses, and we got to learn about some of the new products Tillamook has in development. 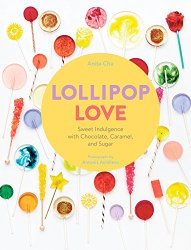 I can’t reveal specifics, but let’s say they involve ice cream – much more exciting than chili peppers! 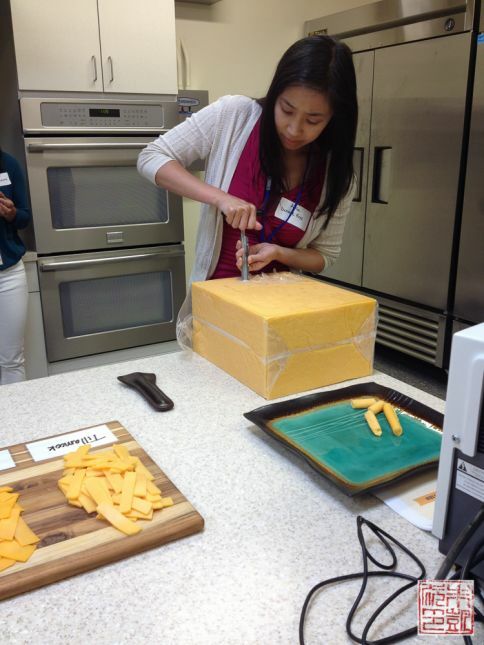 We were all invited to take a turn pulling a sample of cheese, which is how they taste test their cheese for quality. Although Jill reassured us that it took practice to pull a good sample and there was no shame in messing up, no one in our group failed – and the pressure mounted as we went down the line and nobody wanted to be the first one to not pull a good sample out! Fortunately I didn’t break the streak! 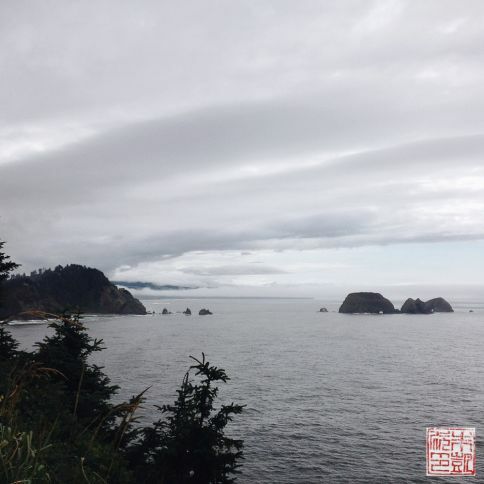 After a very full morning at the Tillamook factory, we got to take a drive down the beautiful Oregon coast and take in the spectacular scenery. I’ve never gotten to see this part of the West coast before so I loved it. Even in mid-summer it’s overcast and everything is shades of cool blue, grey, and platinum. Enjoying the afternoon with my fellow bloggers Jesseca, Deseree, and Jane! We stopped for the evening at Pacific City, a little beach town. 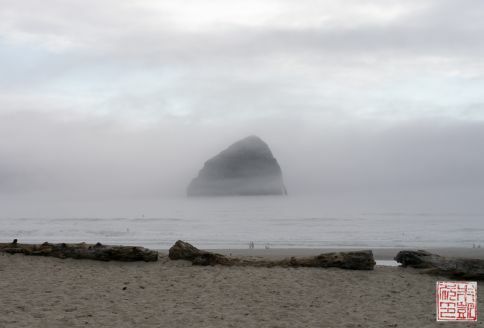 Its most memorable landmark is a geological form called a “seastack”: a solitary rock formation rising out of the water. Although it looks close, it’s actually about a mile out from the shore, and if you can see the people in the photo, you can get a better sense of how large it really is. It’s quite a striking sight, especially if you don’t know it’s there and it emerges unexpectedly from the fog like a mysterious monolith. 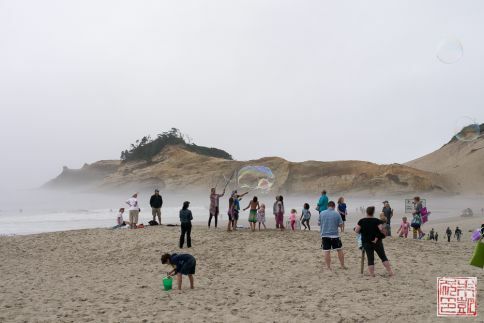 Quite a few families were enjoying a beach vacation at Pacific City, including these bubble makers making their giant bubbles for the delight of nearby children. I kind of think this scene captures Oregon’s quirkiness perfectly. The beach vacation vibe continued with dinner on the beach. 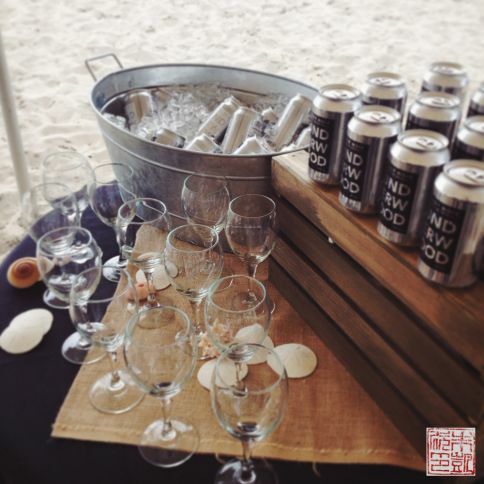 We had a tent set up just for us, and wine and oysters waiting for us when we showed up – what luxury! 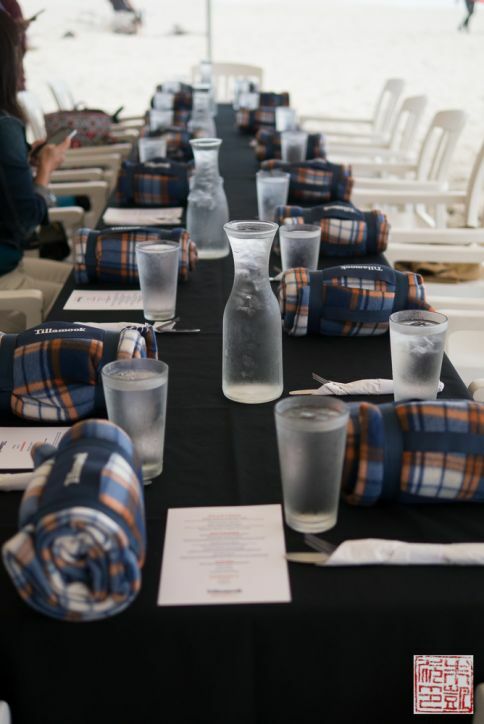 We continued to be spoiled by all the little touches, like the individual blankets for everyone so we could keep warm when the sun set and the fog rolled in. I was continually impressed by how pampered we were on this trip. Since most of the bloggers were moms, many of us commented that this was the most relaxing vacation that we (didn’t) have to plan in a long while! 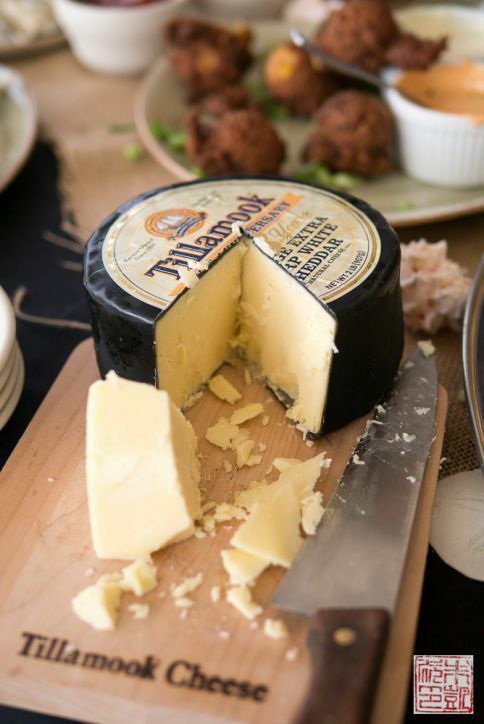 Plenty of Tillamook cheese on hand for hors d’oeuvres time. This is a wheel of their 105th anniversary extra sharp white cheddar, aged for over 3 years. The extra aging gives this cheese a great, bold tang and really lovely mouthfeel. We ended dinner with a bonfire on the beach, complete with s’mores and Tillabars. 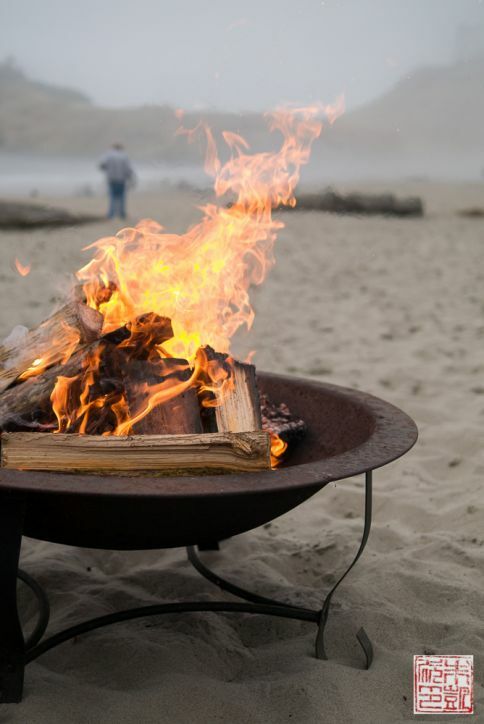 I can’t even remember the last time I was at a bonfire (that sounds kind of sad) and it was clear that everyone else was equally happy and relaxed, and in no hurry for the evening to end. We chatted about the day, our families, making s’mores, and just watched the sparks spiral off into the deepening night. The last morning of the trip, we set off for our final stop: one of the Tillamook dairy farms. Again, Tillamook had us covered (literally) with some cute Hunter boots to protect us from dust and mud! The farm we visited was owned by Ryan and Wendy, a young couple who enjoy sharing stories about their farm with visitors. 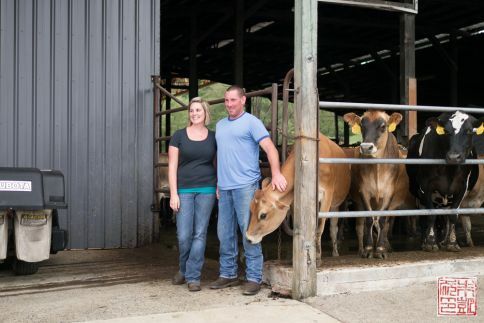 Ryan comes from a family of farmers, while Wendy didn’t know anything about raising cows until she married Ryan. However, she’s fully jumped into the lifestyle, even helping teach newborn calves to nurse while she was 8 months pregnant! Some awfully photogenic cows. All the cows we saw seemed so friendly and curious, and not at all fazed by a bunch of bloggers snapping dozens of photos of them. Wendy and Ryan raise a couple different breeds of cows, mostly Jerseys, and all the milk from their cows goes to making Tillamook products. It’s a full and demanding life – Ryan mentioned how since they’ve hired some helpers he’s been able to “sleep in” until 4:30 AM, but they love it. There’s certainly many tangible rewards – the beautiful Oregon countryside with plenty of space for their children to run around, and some very cute baby calves. Here is a little calf in the newborn barn, munching away. Quite a few of us wanted to take her home. 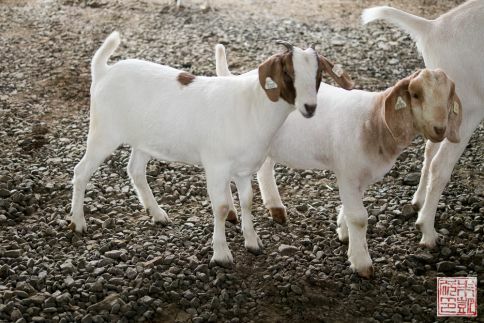 More competitors for cutest thing on the farm: these little baby goats that Wendy and Ryan’s kids are raising. So adorable! Thank you so much to Tillamook and SodaPop PR for a truly memorable and relaxing trip! 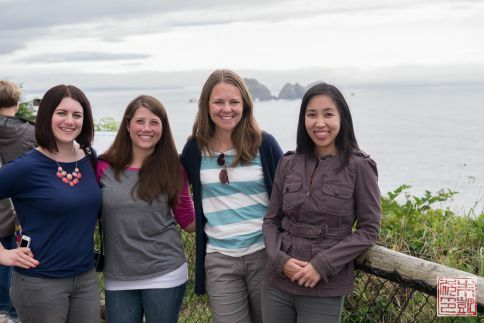 I adored the chance to see the Oregon coast, had a blast learning about Tillamook, and I got to hang out with a lovely bunch of fellow bloggers as well! After coming home, I kept checking my refrigerator for Tillamook ice cream and yogurt to magically appear and soothe my withdrawal cravings! Since that didn’t happen, I went and picked some up at the store instead, along with some Tillamook cheddar to make these fab cheddar and black pepper gougères. 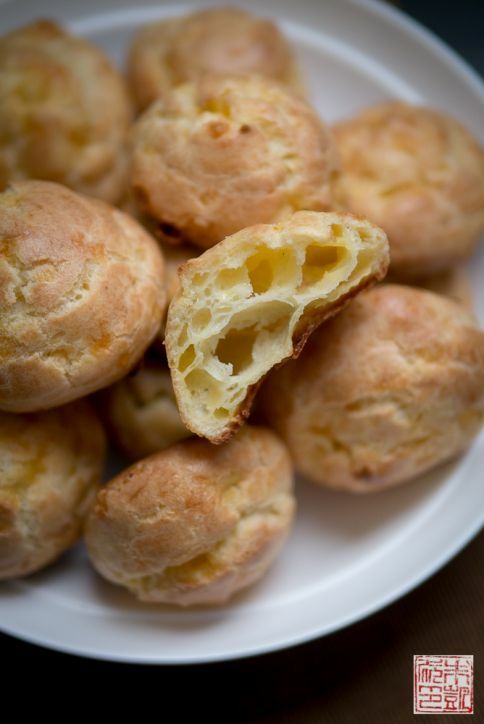 Gougères are pretty much savory cream puffs, which is probably why I like making them. I find that stronger, more pungent cheeses work best, which is why using an extra sharp cheddar like Tillamook’s really makes them shine. 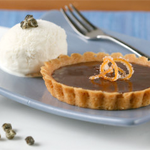 The addition of freshly ground black peppercorns gives a little bit of spice that makes them extra addictive. When I do savory pastry, I always wonder why I don’t do it more often. These are a great alternative to your regular dinner rolls and don’t take much longer to make. 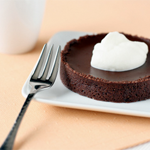 Preheat oven to 375 degrees F. Line a couple of baking sheets with silicone baking mats or parchment paper. Combine milk, water, butter, and sugar in a heavy bottomed medium saucepan and heat on medium high. While milk is heating up, combine flour, pepper, salt together in a small bowl. Once the mixture is at a rolling boil, add all of the flour mixture at once, reduce the heat to medium and start to stir the mixture vigorously with a wooden spoon. The dough should come together into a ball. Continue stirring for another 3-4 minutes until it is completely smooth and soft. 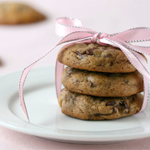 Transfer the dough into a bowl of a stand mixer fitted with the paddle attachment and beat to cool it down slightly. Add in four eggs one at a time, beating after each egg has been added to incorporate it into the dough. The dough should be very thick and shiny but not liquidy. Add in the cheese and fold in to incorporate. Transfer the dough to a pastry bag fitted with a 1 inch plain tip. Pipe out 2" round mounds of dough on the prepared baking sheet, spacing about 2 inches apart. 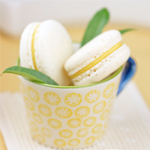 Beat the last egg with a little water to form an egg wash, then brush lightly over the puffs. Bake in oven for about 18-20 minutes, rotating halfway through. The puffs should turn golden brown and be dry to the touch. 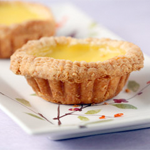 It's easier to underbake than to overbake; make sure they are dry before taking out. 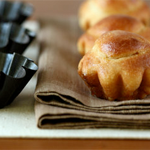 Place sheet on a wire rack and let puffs cool before eating. When does the cheese go in? Thanks! Whoops! I added the instruction back in – it should be after the eggs. Thanks! At what point do we incorporate the cheese?Is it with the milk or the flour? I left out the instruction by accident – it’s been added back in. You can add in the cheese at the end after the eggs. Thanks for the catch! wow, what a great trip! 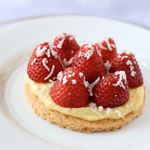 and those gougères are making my mouth water! This looks like an amazing experience! Wow, and it seems they had everything perfect for you. So jealous of everyone that got to visit Tillamook! 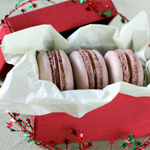 Love these Gougères – I’ll take all 24, please. 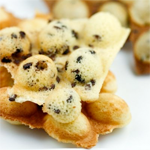 I tried to make gourgeres once and they did not turn out sadly but I’ll have to give them another go. Feast Portland is happening right now and I am so sad I am not there. 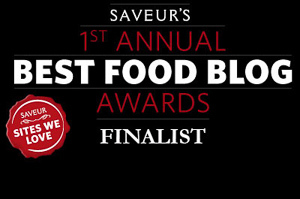 It seems to be a very foodie centric place right now and has a booming beer scene as well. What a magical trip, Oregon is one of my absolute favorite places in the world and the coast is spectacular. I visited Tilamook a million years ago and I am a huge fan of their cheeses. Gougères are often served as amuse-bouche in France and I am always disappointed to get one bite! 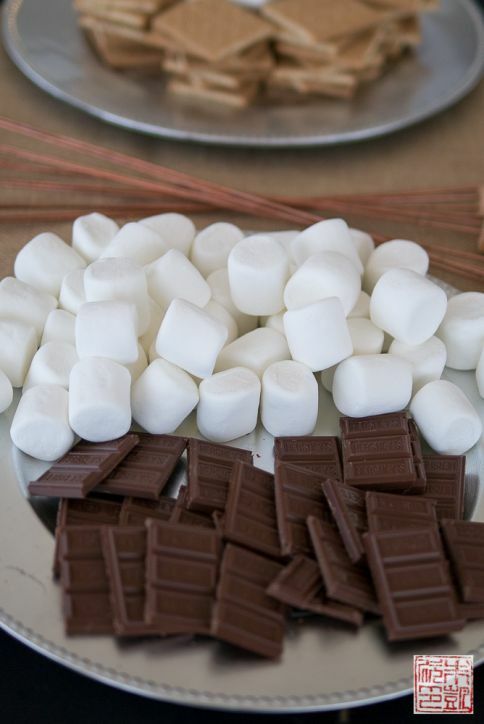 With this recipe I can make a whole batch! What an absolutely AMAZING experience…everything about it – the cheese, Oregon, the tour! 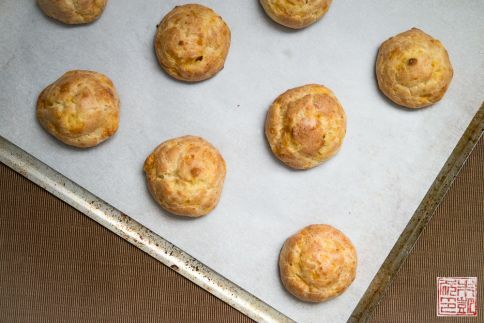 And these gougeres sound utterly addicting. Growing up in New England I’m a Cabot girl through and through though I have enjoyed Tillamook on occasion. I’ve been meaning to make some gorgres ever since I tried them at Central in Washington DC. Never heard of Tillamook before, but now I know and need to try their cheese. This sounds like it was such a wonderful experience! How cool that you got to do that. Great recipe too! What a trip! This is definitely one for the memory books. Ice cream and cheese, can it get any better? What a great trip! So many great experiences. And all of them yummy! So happy for you. Sounds like a fun trip, I’d love to do something like that! The gougeres sound yummy! What a wonderful trip!! Ice cream, cheese?! Must’ve been heaven! Your gougeres looks amazing!! What an amazing experience. Thanks for sharing! 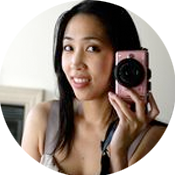 Anita – it was wonderful to meet you on the trip and loved your recap! I must make those gougeres SOON! 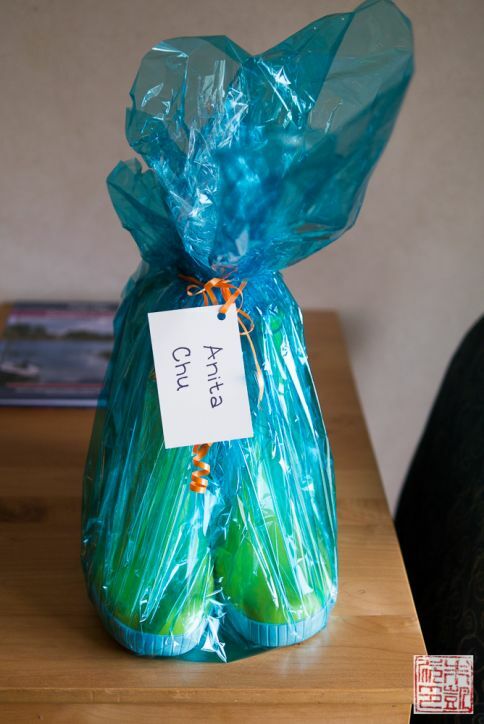 Anita – it was great to meet you on the trip – so much fun! Great recap and I MUST make those divine gourgeres soon!! 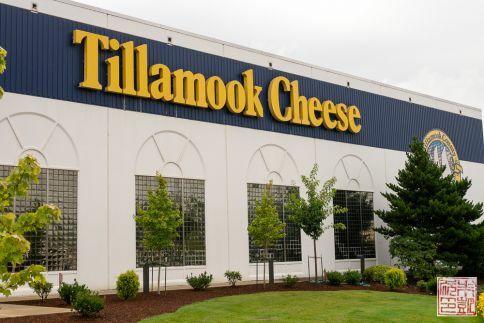 I love Tillamook cheese and appreciate the virtual tour you were able to take us on. 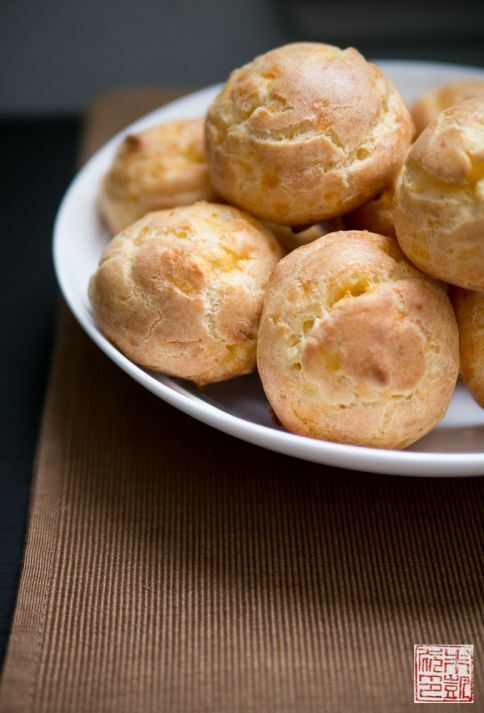 Your gougeres look perfect! So light and airy.